We offer a bespoke product development service. Gifts of Distinction can develop exclusive branded full colour cufflinks for you and your company. 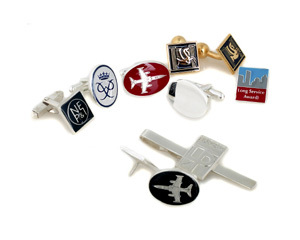 The dominant production method for cufflink production is Stamp and Enameling. Several examples of High Quality UK manufactured hand made lapel pin. Note the polished edges, excellent soldering of the well made component parts, hand finished, in gold, silver silver plate or any material you wish. Produced here in Birmingham using Die making, stamping, hand polishing and enameling. Any shape can be made to order.